Inventory We are a resale marketplace, not a box office or venue. Ticket prices may exceed face value. This site is not owned by Bank Of America Stadium . 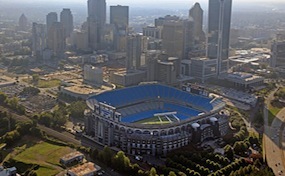 Bank of America Stadium (formerly known as Carolinas Stadium and Ericsson Stadium) is a 73,778-seat football stadium located on 33 acres of land in uptown Charlotte, North Carolina, USA. It is the home facility of the Carolina Panthers NFL franchise. Bank of America Stadium also hosts the annual Meineke Car Care Bowl which features teams from the Atlantic Coast Conference and the Big East. It will host the ACC Championship Games. The stadium has also been the site for several games featuring the East Carolina University Pirates. BankofAmerica.StadiumCharlotte.com is not affiliated with any primary box office or supplier. We are a privately owned and operated business specializing in sales in the secondary market. To buy tickets for any Bank of America Stadium events in Charlotte simply click on the event of interest or call our operators at anytime.